Standing near the intersection of Transverse Drive and Middle Drive West in Golden Gate Park, looking downhill towards Elk Glen Lake, I am surrounded by urban forest, no hint of the city in sight. The air is warm and smells pungent today, like a forest should! A red-tailed hawk is circling overhead. Tall, jagged Monterey cypresses, feathery Eucalyptus and top-loaded Monterey pines stand out against the sky. These are the “big three,” the trees that have provided the skeletal structure for this miraculous urban forest since it was established in this unlikely location in the nineteenth century. Many of the grand, old original trees remain, although nearing the end of life. The old Monterey pines (particularly susceptible to pine pitch canker) are going first. The job of caring for, and renewing, this remarkable urban forest requires special knowledge, experience and dedication. We are lucky to have a crew of urban foresters in the park who fit this bill! In front of me, in the foreground (pictured above), is a new forest “plantation,” being managed by the forestry division in the park. To the untrained eye this baby forest might not look like much, but with a bit of squinting and imagination it’s not too difficult to envision what it will look like in fifty years or so, when the trees have grown in, adapted to local growing conditions and are properly thinned out. 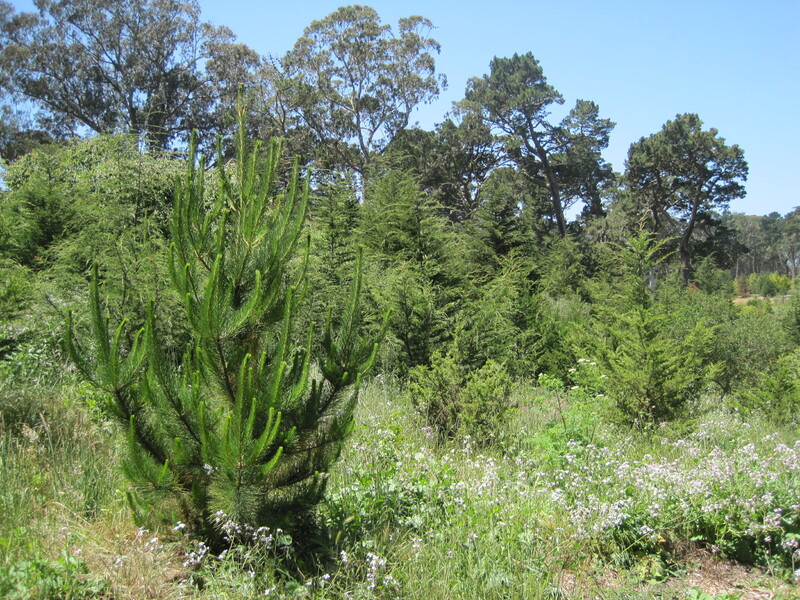 The techniques used by the forestry division today in Golden Gate Park have evolved in many ways since William Hammond Hall’s experiments with growing trees on these sand dunes. But the basic approach that he adopted, through trial and error, has stood the test of time. Like in the nineteenth century, growing conditions are harsh, with challenging soil and strong, salty winds blowing off the ocean. Some types of trees do better than others in these conditions. As Hall demonstrated, it is wise to build on successes and learn from experience. Although some basic conditions remain the same, managing a 150-year-old forest is different from planting one from scratch. When a large old tree dies in this forest today, it not only creates a gap that must be filled in, but its absence affects all the trees around it, which have grown accustomed to its presence. Often nearby trees will also weaken or fail without the support or shelter afforded by the missing tree. So forest management involves assessment of the condition of standing trees, as well as fallen ones. Sometimes weakened old trees must be removed for public safely before they fall down on their own and this may create sufficient room for reforestation. Areas selected for new forest plantations must be large enough to give young trees the sun and water they need without too much competition from older trees. But shelter is also important, as wind is a harsh environmental factor in this park. Planting new sapplings thickly, sheltering them from the wind and salt air by surrounding them with shrubby thickets, then thinning the plantations once they are established yields the desired result. But the process takes a long time and requires a lot of patience. So it seems that questions regarding the management of trees in Golden Gate Park are time-honored and perhaps inevitable. But as we take up these questions, we should beware of missing the forest for the trees! This entry was posted in history, plants, trees/urban forest and tagged Frederick Law Olmsted, golden gate park, golden gate park history, urban forest, urban parks. Bookmark the permalink.